When Martin Kunz, a professor in the Cosmology Group » at the University of Geneva, and his team at the CSCS commandeer “Monte Rosa”, they mean business. Hardly any other computer job gets a look-in on the CSCS supercomputer as it works to ninety per cent of its capacity. Hardly surprising when you consider that the scientists are looking to simulate a particular moment in the origin of the universe when complex mechanisms and all manner of scales played a key role: the point when topological defects, so-called “cosmic strings” to be precise, might have formed. Topological defects are a common phenomenon in solid-state physics: if an area of a crystal does not undergo the phase transition, in other words reorganisation in the crystal lattice, during crystallisation, a topological defect develops in the lattice. To put it simply, in cosmology topological defects are supposed to form where a phase transition occurs in the universe. This was supposedly the case a few fractions of a second after the Big Bang. The phase transition caused different basic states to develop in different areas of the cosmos. Wherever the different field conditions ultimately met, topological defects such as cosmic strings were able to form. They are supposed to be less than a trillionth the size of a hydrogen atom in diameter and quasi one-dimensional – “quasi” because, despite their defined one-dimensionality, they supposedly extend through space almost infinitely and as extremely thin “worms”. In theory, these worms weigh about twenty per cent of the Earth’s mass per kilometre in length. Cosmic strings: A view through the simulated universe, gained at the CSCS supercomputer “Monte Rosa”. 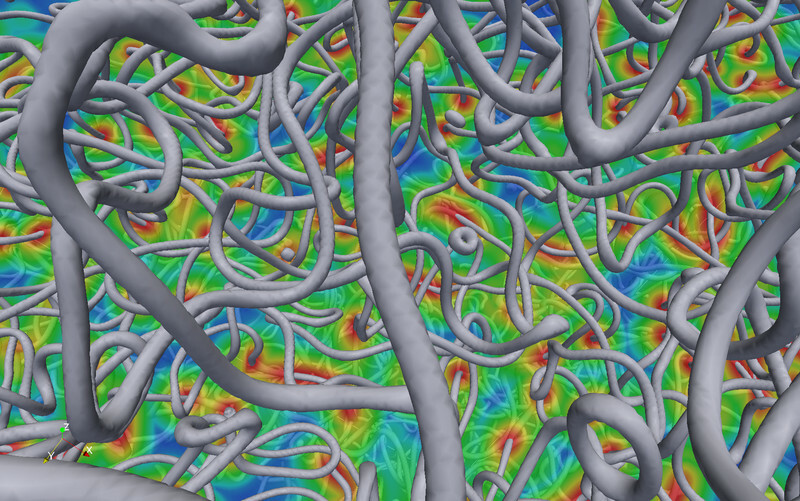 The image shows cosmic strings (in grey) and the field density (in colour on a plane through the simulation box). Most of the strings form a tangled network, but they can also build string loops that were chopped off the long strings through intersections. (Image: David Daverio, Université de Genève, using simulation data obtained at the CSCS. To detect the cosmic strings, the team thus simulates their location and distribution in different field conditions and measures their energy density. The results of the simulations are channelled into a programme that calculates the corresponding fluctuations in the cosmic background radiation using linearised equations. By comparing the results with the cosmic background radiation data, which the Planck satellite supplies during its mission, the researchers are hoping to be able to confirm these unusual defects. The cosmic background radiation may well only have originated 380,000 years after the Big Bang; however, it exhibits minimal fluctuations that, from what we know today, stem from the early universe. “If topological defects are present in the universe, they produce additional fluctuations that effectively contain a finger print of the defects and thus allow conclusions to be drawn as to their nature and origin,” says Kunz. Martin Kunz’s doctoral student David Daverio helped to improve the complex simulations significantly. In his Master’s thesis, he completely rewrote the parallelisation of the codes used, which now means that the simulations can be carried out considerably more efficiently and a resolution that is sixty-four times higher achieved. This is an advantage for the researchers as time is of the essence. By 2014 at the latest, the results of the simulations need to be on hand so that they can be compared with the new Planck data. If the theories on the links between inflation, the formation of cosmic strings and the existence of a GUT are correct, this should be proved from the Planck data by then at the latest. Otherwise, once again it will be a case of excluding a model and trying to detect the supposed cosmic strings in another way – or bury them once and for all.